A few months ago a new group of elementary-aged girls came to our church. I was teaching a lesson on Creation, and after a few minutes, I realized that they didn’t know anything about it. Because of this, I shared the plan of salvation with them, and five of the girls accepted Christ! I was glad that they made this decision, but it also grieved my heart, because these children were in fourth and fifth grade and they had obviously never heard the Gospel before. On another occasion, I met a fifth-grade girl named Bella, who asked me with tears in her eyes what she should do. The kids at her school were bullying Bella because she was open about her faith. Bella told me the same thing was happening to her little sister, who was in third grade. In trying to encourage and comfort Bella, I asked her what school she went to—it was one that had a Good News Club! I was thrilled to tell her that there were a group of believers having a Christian club for kids at her school and that they would love for her and her sister to join them! I was so thankful for that club and those volunteers! I knew she would get the love and support she needed. We have to bring the light of Christ into our schools again. Children need to hear the Good News, but children like Bella, who already believe need us to be there as well! We need to support them as they stand in faith in a world that is increasingly opposed to Christianity. Seventeen of the schools in our county had Good News Clubs last year. 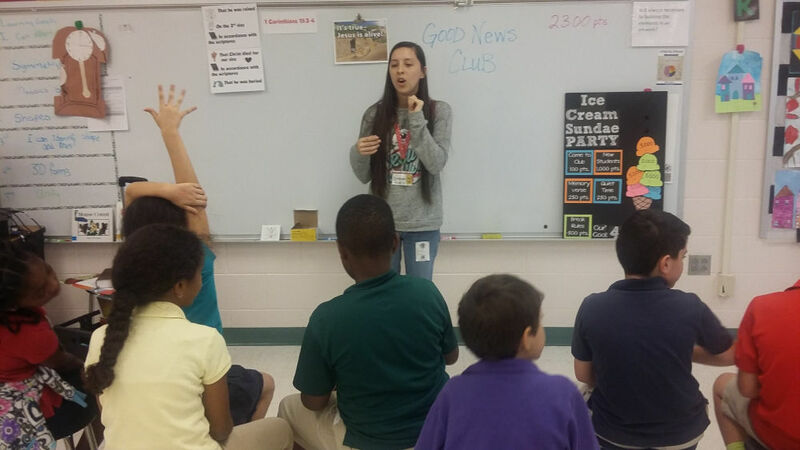 Over 475 children attended these clubs and out of those, 57 children received the Lord Jesus as their Savior! I am so thankful for all of our volunteers! They are sharing the Gospel with these children and bringing the love of God into their schools!